It’s Official – The Euro Zone Is Out of Recession! It’s official, folks! After six straight months of contraction, the euro zone is finally out of recession! That’s right – last quarter, the region finally broke its longest streak of contraction in over 40 years as the economy expanded by 0.3%. But although it beat forecasts that called for a growth of 0.2%, the upside surprise in the Q2 2013 figure was sort of offset by a downward revision to the contraction in Q1 from 0.2% to 0.3%. Germany and France led the region back into expansion as strong business and consumer spending boosted the two powerhouse economies. Germany saw its output grow by 0.7%, beating the 0.6% consensus forecast. Likewise, France exceeded expectations with its growth of 0.5% (versus 0.2% forecasts), and in the process, escaped a domestic recession of its own. Aside from the impressive performances of the region’s two largest economies, we saw other countries step up. Portugal, whose GDP rose by 1.1%, posted its strongest pace of growth in almost three years. For a country that was recently bailed out, that ain’t half bad, eh? We also saw improvements from Finland and Austria. Unfortunately, growth in the region remained uneven and it still had its sore spots. Cyprus, which was bailed out earlier this year, saw its economy shrink by 1.4%. Meanwhile, the Netherlands, Italy, Greece, and Spain remained in contraction. Is this the reason why EUR/USD failed to stage a convincing rally after the reports were released? 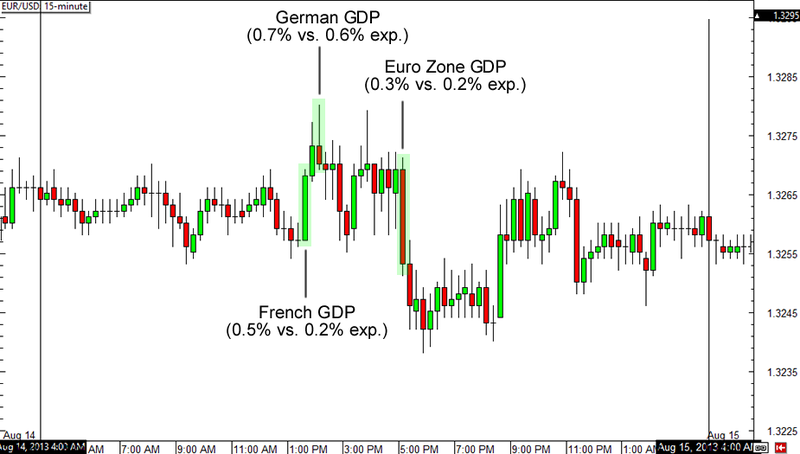 Looking at the pair’s 15-minute chart we can see that the initial uptick in reaction to the positive GDPs turned out to be the intraday high for the pair as the initial move was quickly erased over the next few hours. One possible reason for this is that traders have already been pricing in positive GDP numbers. After all, we’ve been hearing nothing but optimistic predictions for weeks. Another possible explanation is investors’ cautiousness over the region’s persistent high unemployment numbers, tight credit conditions, and government austerity measures. Last but definitely not least, traders might have remembered the ECB’s ominous remarks about growth in the region. If you remember, the central bank recently downgraded its growth forecasts from -0.4% to -0.6% in its monthly bulletin. Keep in mind that the GDP report is a lagging indicator. As such, it has limited implications on the outlook for the euro zone. For now it seems that while market players are cheering for the improvements seen in the euro region, a lot of them are still waiting for better, more forward-looking indicators that would support an optimistic outlook. Maybe next week’s PMIs will do the trick? Do you think this is the start of a strong recovery for the euro zone?